The Impression does honour to her name. A ship that will leave an impression on you whenever you see it. And she is now offered with an unique opportunity. She is currently docked at the Jongert shipyard, so you can choose to let it be serviced by Jongert, give the ship a little overhaul, or you can completely refit it to your likings if desired. Or you choose to just buy it and set sail right away to your destination. Everything is possible with this beauty. Masts are aluminium Nirvana, with track for fully battened main, with lazy jacs for reefing. 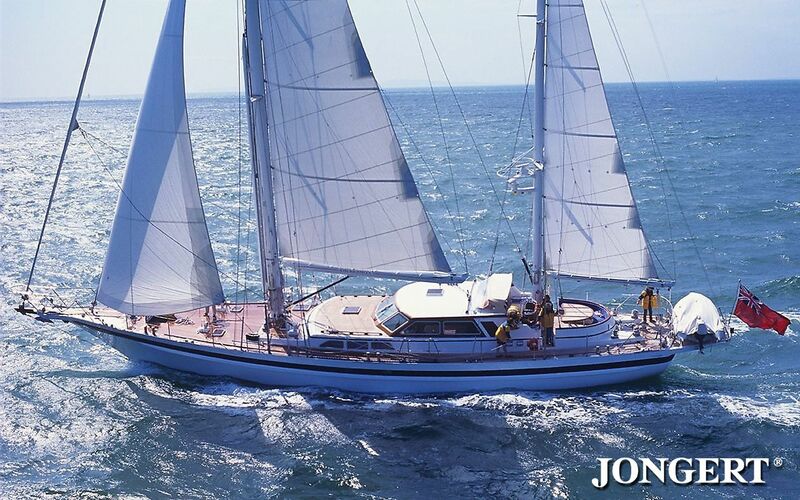 The S/Y Impression is an example of the quality and class that a Jongert provides. She was launched in 1995 and has been in the hands of the same owner ever since. The owner has been extremely involved in the building of the yacht. Every week during constructing he visited the yard to see how his yacht was progressing. She was displayed at the Dusseldorf boat show before even being delivered to the owner. She was the biggest yacht ever to be presented inside the Dusseldorf Messe. The current Chief Engineer was involved in the building of S/Y Impression and has continued with the servicing. All the work done to the ship has been meticulously documented and maintenance was never skipped. When you walk into the ship, you are welcomed by the warmth and romance of the interior. Every piece is hand made and displays the craftmanship of Jongert. When you look around it is like the ship rolled out the production hall just a week ago. The entire ship has a white and natural wood look. This gives the ship a classic but also modern look and feel. The high gloss finish on the wood reflects the light in a way that brings the wood alive. You have many areas onboard to sit and relax with your friends and family. During the day you sit outside in the lounge area with a nice glass of wine in the sun. In the evening you go inside and dine in the saloon. After dinner you move to the bar for a nice chat and a drink. When time has come and everybody retreats to their cabin, you are welcomed in your suite. The first thing you see are the big windows in the stern overlooking the sea. While you are watching the news on the television, you are thinking about taking a bath in your personal bathtub. Your guests have a choice of two cabins, each has twin beds and a private bathroom. When it comes to going to shore you ask the crew for the tender, which can be launched using a Jongert boom system. The stern platform can be lowered hydraulically to access the tender, and it can be used as a swim platform or for stern boarding. You, as the future owner of the Impression, will be presented with an unique opportunity. At this moment S/Y Impression is docked at the Jongert shipyard in Wieringerwerf. This makes it possible for you to buy the yacht and immediately bring her inside the yard,and have her refitted and modified exactly to your taste.So when the ship sets sail again you have not bought just a Jongert, you have bought your Jongert! It will be like you receive a brand new ship.